If BioShock Infinite debuts with a gameplay demo and a trailer that includes no Little Sisters, no Rapture, no — so far — apparent storyline connection to earlier BioShocks, is it really a BioShock game? Yes, its creator told Kotaku. "It would be dishonest to say this is not BioShock," Irrational Games creative director Ken Levine told Kotaku in an interview last week, just a couple of hours after the game debuted before the gaming press in New York City. I had seen the game played live in front of me and been impressed. (Read Kotaku's BioShock Infinite preview.) But I'd also been expecting Levine and Irrational to be working on something other than a BioShock. After all, they had turned down the opportunity to develop this year's BioShock 2, which was built primarily by Irrational sister studios under parent publisher Take Two Interactive. Plus, this game takes place in sky. The lead character has powers that shoot from his left hand and guns in his right, but, really, I asked Levine this is a BioShock? "For an audience, I totally expect them to be like, 'What? I don't quite understand it,'" Levine said. "'It's a sequel but is it a sequel?' It's a meta-question. I'm comfortable with that." He won't say whether the game is connected to the storyline of those first two BioShocks. "I don't want to think about that," he said. "I don't think it's particularly constructive to have that conversation." The game is clearly not BioShock 2 (pictured at left). That's a project Irrational rejected several years ago, after the original '07 BioShock was released. "It wasn't right after BioShock that we determined what we were going to do," Levine said. "We did sort of play around with a bunch of different things. One thing that was quickly apparent to us was that BioShock 2 wasn't the right product for us because of when they wanted it, because the company wanted it to be in Rapture, which makes sense, they wanted a follow-up. As our team, independent of BioShock 2, we had said what we wanted to say about that world as a studio." There was enough of a scheme to the first BioShock that Levine liked. It helped the building of Infinite. "We were really looking to take on a project where we had a basic framework for some things — look, we had a framework for BioShock as well from a previous game we did [System Shock] — but also, and I've said this to other people, that there will be no sacred cows. Anything was up for grabs in terms of what would be there and what wouldn't be there." Levine identifies two qualities that define BioShock Infinite as a BioShock game. First: "It is set in a place that is both completely strange and fantastical but also strangely grounded and strangely familiar, believable," he said. For the first two BioShocks that location was Rapture a failed underwater city built with Objectivist principles and infused with a 1950s Art Deco design. Infinite's location is the floating city of Columbia, circa 1912, a city populated by proud Americans who view their country as a technologically great, ascendant Caucasian-led God-fearing society. "Fantastical" but "strangely familiar" indeed. Said Levine: "To do another game that felt like that but wasn't called BioShock game would seem dishonest." Second defining BioShock quality: "The other thing is that when you deal with enemies you have a huge amount of expressability in how you approach a problem set. How I want to play the game is very different from how you're going to play the game." This other quality was a BioShock hallmark. Each enemy encounter in the first two games could be handled with a variety of methods: shooting, hacking, stealth, offensive plasmid (think: magic) powers, deputizing robots, confusing and converting enemies, springing traps, and so on. Infinite's got that kind of mixed arsenal, potentially one that offers even more variety than the first two games. As noted in my preview last week, the tactical variety is enhanced by two gameplay additions. One is the presence of Elizabeth, the woman being rescued in Columbia by playable protagonist Booker DeWitt. Of her, Levine says, "She's an amplifier for your powers if you choose to have her be an amplifier for your powers. You can still approach all of the problems in a traditional BioShock way. Elizabeth doesn't need to solve this problem. She is there to enable things that of a scale that you just couldn't do in BioShock 1." Last week, as an example, I described her pulling a rain cloud over some enemies, a move that enabled DeWitt to fry the enemies with a lightning storm. The computer-controlled Elizabeth is also a storytelling experiment, according to Levine: "There's no component of squad commands with her in the game. She is a self-driven entity. She will react if you go this way or that way on the field. She'll say different things; she'll react different ways verbally. She's kind of a combination of what you saw on the screen and there's a Left 4 Dead component about her in terms of her saying things that are driven by the simulation... she never kills anybody on her own. She sets you up to do things. We don't want her driving the game for you. Ever." The BioShock Infinite player's other arsenal expansion is the Skyline, the city-stitching railways I briefly described in last week's preview. Levine elaborated on their function: "It is our vehicle," he said, agreeing with my suggestion that they may allow a pace change in Irrational's first-person shooter similar to that of the Warthog in Halo, "but very importantly it's not like a Ratchet & Clank movement thing. There's gonna be lots of use for these throughout the world in the outside spaces. There's going to be line after line. You're going to be jumping between them. It's a way to have you move very fast in the world, to have you cover large distances and to have enemies cover large distances that wasn't flat. The problem with flight is that, it's a shooter, we really wanted you to be in control of your shooting so there's a degree of being on a rollercoaster with guns. But a rollercoaster overlapping another rollercoaster overlapping another rollercoaster overlapping another rollercoaster. And, ok they're coming from there so I'm going to go around and flank them from here." 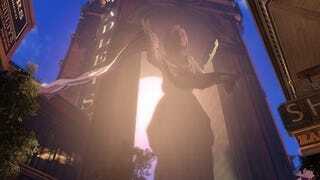 Levine promised that a future demonstration of BioShock Infinite will focus on the Skyline. When Levine and Irrational opted out of making BioShock 2, it was easy to assume they had left the franchise. In some ways they have. But if you believe in Levine's core principles of what makes a BioShock game a BioShock game, then Infinite does fit. Honestly, it does.